Iran will resume nuclear talks with six world powers on Feb. 26 in Almaty, Kazakhstan, European Union diplomats said Tuesday. “Helga Schmid, Deputy Secretary General of the European External Action Service, agreed today with Dr Ali Bagheri, Deputy Secretary of the supreme national security council of Iran, that the next round of talks between the E3+3 and Iran on Iran's nuclear programme will take place in Almaty, Kazakhstan on 26th February,” a spokesperson for EU foreign policy chief Catherine Ashton said in a statement Tuesday. Talks have been on hiatus since last summer, after three rounds of talks failed to narrow agreement on a deal under which Iran would stop its 20% enrichment activities. Iran notified the IAEA last week that it intends to install as many as 3,000 more advanced IR-2M centrifuges at its enrichment plant at Natanz. Iran has been giving mixed signals about returning to the negotiating table, as well as whether it would take up an offer for direct talks with the United States. Iran has tentatively agreed to resume nuclear talks with six world powers on January 28-29, at a location still to be decided, Iranian media reported Wednesday. However, western negotiators did not confirm the report, saying consultations are ongoing. “It is also possible that a final decision on the venue could lead to change in date,” Iran’s Student News Agency (ISNA) said. Talks have been delayed by Iran haggling over the agenda for the next talks, Al Monitor reported this week. “Iran wants the agenda for a new round of nuclear talks to refer explicitly to sanctions relief and what it views as its right to enrich uranium,” Al Monitor’s Barbara Slavin wrote January 14. “The E3+3 have repeatedly responded to the points made by Iran and have urged Iran to seriously address the concerns of the international community on the peaceful nature of Iran’s nuclear programme,” the statement from Ashton’s spokesperson continued. The lead US envoy to the talks, Under Secretary of State for Political Affairs Wendy Sherman, was in the UK earlier this week for meetings with fellow G8 political directors, the State Department said. Separately, Iran is hosting a senior team from the International Atomic Energy Agency (IAEA) in Tehran Wednesday. In anticipation of resumed nuclear negotiations, seven former Iranian parliamentarians called in an open letter to President Obama, the EU’s Ashton, and Iran’s Supreme Leader Khamenei this week for direct US-Iran negotiations and for broader concessions from both sides to achieve a compromise. “At this juncture, we believe transparent and bilateral dialogue between the U.S. and Iranian governments regarding Iran’s nuclear program would be beneficial and effective,” . the seven former Majles members, including Seyed Aliakbar Mousavi, and Fatemeh Haghighatjoo, both now living in the US, wrote. Iran analysts said the letter is significant because it shows the wide consensus even among Iranian reformists on the terms of a viable compromise. “The central gravity logically on this issue comes down to this issue: Iran has to be transparent and its rights have to be respected,” Trita Parsi, head of the National Iranian American Council, said. Update: Russian Deputy Foreign Minister Sergei Ryabkov said Thursday the parties are still trying to firm up a late January date for talks, but it’s not finalized yet, Reuters reports. 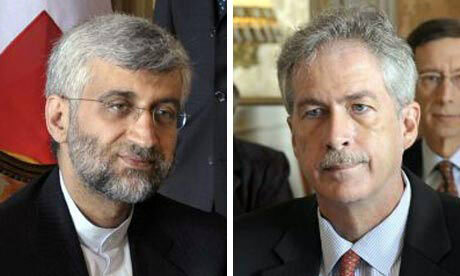 Negotiators for the P5+1 and Iran have held talks on arranging a new meeting soon. Helga Schmid, the deputy to European Union foreign policy chief Catherine Ashton, spoke by phone with her Iranian counterpart Dr. Ali Bagheri on December 31st, a European diplomat said. “The two of them are working on the next meeting to happen soon,” a spokesperson for Ashton’s office said Wednesday. “We have concluded several rounds of negotiations with the Group. The latest was six months ago in Russia…We hope to soon conduct negotiations with P5+1,” Saeed Jalili, the head of Iran's national security council, told reporters after a speech in New Delhi Wednesday, Outlook India reported Wednesday. “The time and venue has not been finalized but we hope it will be done soon,” Jalili continued. Details on when and where the next round of talks will be held have still not been released, but a meeting is expected this month. Jalili is on a three-day official visit to India. While there, he is due to meet with Indian Foreign Minister Salman Khurshid, National Security Advisor Shivshankar Menon and Foreign Secretary Ranjan Mathai, the Times of India reported. Jalili is then scheduled to travel to Afghanistan, Reuters said.